Some people like to be prepared for pretty much anything you can think of. They keep food and water, medicines, guns and ammunition, and just an endless myriad of supplies and equipment stashed away for bad times. In the 21st century (sounds weird doesn’t it? But yes, we are in the 21st century), people that do this are generally referred to as preppers or survivalists. However, 60 years or so ago, it was very common for people to have bomb shelters in their back yards. Tensions with Russia after WWII left the United States in a state of unease referred to as the cold war. 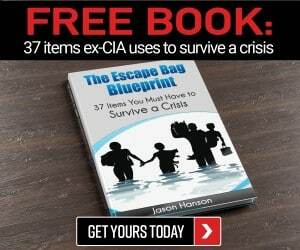 During this time, the government suggested that families make contingency plans in the event of a thermo nuclear war and told them to stockpile dry foods and water at the minimum, and for them to build backyard bomb shelters if they could. There are a lot of these bomb shelters lying forgotten in people’s back yards these days. If your house was built before 1965 there is a possibility that the homeowners built one in the back yard but it has gone forgotten. You can possibly find out if your house has one by searching through old county records to see if there are building permits from that era for such a structure. You can also search your yard for like features that could be obscuring an entry door. 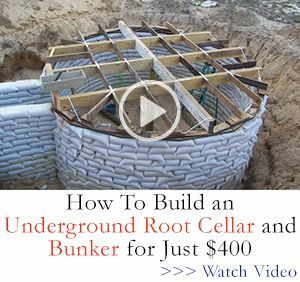 You might get lucky and find out you have one, if so you can refurbish it and put it to use as your doomsday shelter and restock it. I recall a story where someone found one in their yard and it was still stocked with goods from the 1950’s. Actually I Googled that subject and got over 68,000 results. Another part of being prepared is to have a means of protecting yourself and your loved ones. For many people the go to means of protection are firearms. That’s what I would suggest for anyone to use. But in the event that you don’t own firearms and something happens that you need weapons, and you need them now, you might have to rely on what you have around the house. So, how do you go about turning everyday items into a weapon you ask? Well, I am going to give you some ideas here to get you thinking in that direction. Back before man used guns to kill each, other he used sharpened pointy bladed weapons. Pointy and stabby, sharp and cutty, early weapons where fairly brutal because you had to get in all close and personal like to dispatch the bad guy. Not to mention it gets pretty messy. Shovels are made for digging right? Well, during WWI especially (because they were doing a lot of digging in those trenches), but also WWII, the Korean War and probably Vietnam, a lot of men were killed by having their heads bashed in or nearly cut off with a trenching tool (AKA a shovel). Most people have a shovel in their shed or garage, and here’s how to turn it into a fairly formidable weapon. Find a flat hard surface like a concrete patio, driveway, or sidewalk or if you have a stump or big chunk of a log in your yard, that’ll do. Build a fire and stick the shovel head in it. You probably want to take it off of the handle first so you don’t burn the handle up but you can try it with the handle still attached if you want. If it burns the handle you can just cut it back and refit it because you’re going to cut some length off the handle anyway. The goal is to get the shovel head glowing red hot and hammer it flat, keep it glowing the whole time, you will have to stick it back in the fire often. Fold the tip of the shovel blade back towards the handle, this concentrates the mass closer to the handle and makes it look a little more axe-like. 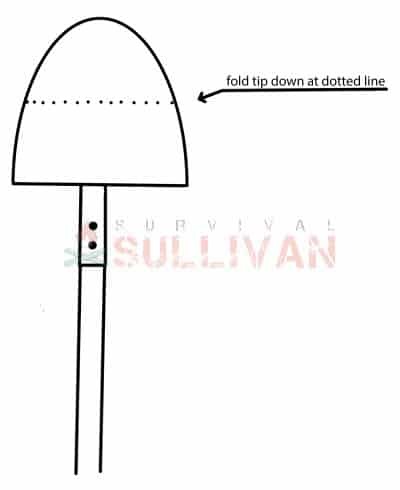 A shovel head has a fold at the top where you step when you’re digging, fold these in towards the blade and hammer them flat. The shovel head was offset on the handle, you want to flip it over back and forth and hammer it until the handle socket is more centered. Once you get it centered hammer the edges to make them thinner plus this makes the steel on the edges more compact, denser. When you heated the shovel head it took out the temper, you need to re-temper it. Heat it again until its glowing cherry red then plunge it into the oil. Leave it in until it’s cooled, if you pull it out while it’s still hot there will likely be a big dripping fireball and you might not get the correct temper. You can file test it by running a file on the edge, if it just skips across the edge it’s tempered. If it cuts and shaves metal from the shovel head then it’s not tempered, re heat it and try again. Sharpen the edges on a grinder or rub it on a rock or concrete, whatever it takes. Put the handle back on it, cut the handle down to a comfortable length, 3 feet or so should be about right. Tie some cloth strips onto the handle about a foot down from the head. This is to keep blood from coming down to your hands and making the handle slippery. Now you have a makeshift axe for chopping flesh that is light and sharp enough to take off an arm or head. You can leave the handle long if you choose to and it will wield more like a halberd (without the spike) but I prefer the shorter version. If you chose this method you can still cut the handle down to about 3 feet or so and it is like Zulu warrior weapon called an Iklwa, which is basically a short spear that is wielded like a sword, chopping and stabbing. You can still leave the handle full length on this too, if you want that little extra bit of reach like a pike. 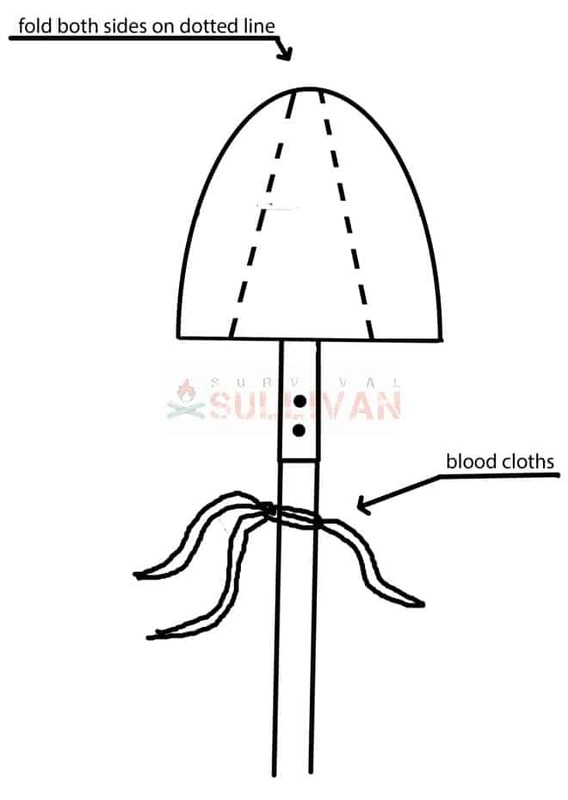 An alternative design is to fold the shovel head sides in towards the middle to make a spear head out of it rather than an axe head. Make sure you make it good and pointy and about 3-4 inches wide at the base and most of the length of the blade tapering to a point, then sharpen the edges. 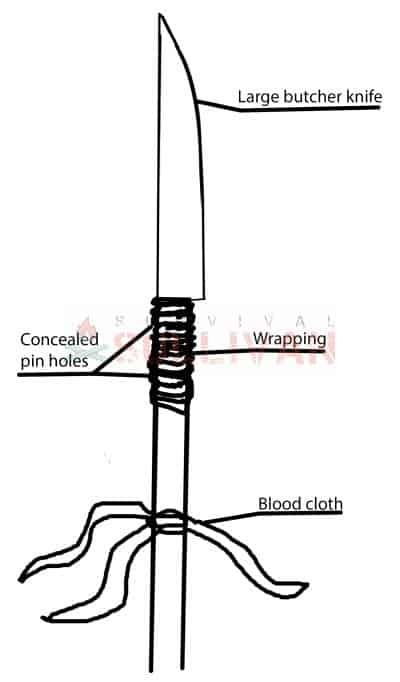 There is another stabbing weapon that you can make from around the house is quicker and easier to make than the one mentioned above. Go in the kitchen and get the biggest, meanest, nastiest butcher knife that you can find (if you have two identical knives then get both). Then go get a rake from the garage. If you don’t have a rake you can use a broom or mop handle, but a rake handle is stronger and heavier duty. You remove the handle(s) from the big nasty butcher knife(s) exposing the tang and set it/them aside (the tang is the part of the knife that is covered by the handles). You get the rake handle and make a slot in the end that the knife tang(s) will fit in. Measure the handle for the holes that are in the knife tang. You can use a tape measure, a piece of paper that you mark with a pen or pencil, or you can hold the knife against the handle and mark it, whatever you have to do. Drill the holes through the handle. If you don’t have a drill then you can burn the hole through by heating a nail or screwdriver, you can twist a screwdriver until you grind a hole through, just whatever you have to do. Just be sure the holes are lined up well so the knife will be tight in the handle. If you have one knife, put it in the handle and put pins in. use screws, bolts, nails, other sticks, ink pens whatever you have to do, look around and see what you have. You might be able to reuse the pins from the knife handles. 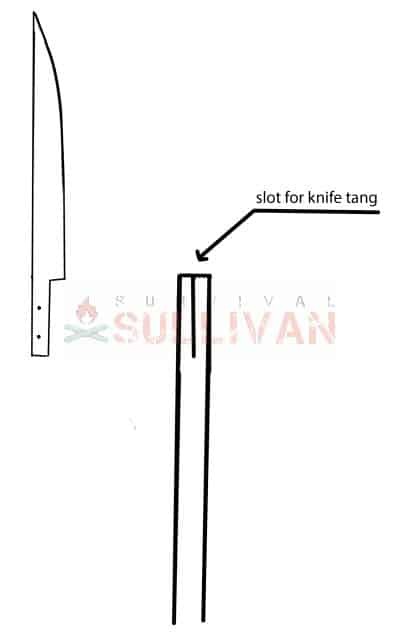 If you are using two knives, put them in with one edge pointing one way and the other knife edge pointing the other way to make it a double edged spear head. You can use glue to help re-enforce it, if you have some. I know gorilla glue is awesome stuff, so is liquid nails/construction adhesive. You can also duct tape the hell out of it if that’s all you have. Just find what you have on hand to get the job done. 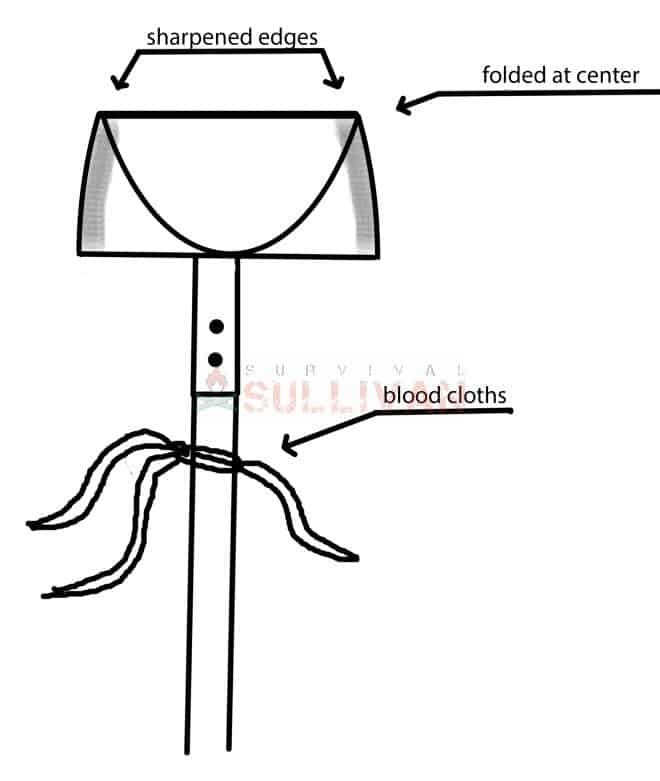 As with the shovel weapon, tie some strips of cloth about a foot below the bladed end. This keeps the blood from running down the handle. Well there you have it, a couple of pretty easy to make improvised weapons for defending your castle against whatever or whoever. Hopefully, you never have to resort to anything like this to defend yourself. If you do, you can make these two simple weapons. If you put your mind to it, I’m sure you can think of other ways to make a weapon. It’s like I always say, your brain is your greatest weapon. The contents of this article is for information purposes only. 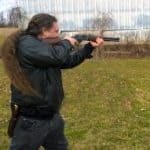 Neither the author nor www.SurvivalSullivan.com shall be held liable for the misuse of the information contained herein or for any damage, injury, death or any other negative consequence. We are not advocating that you replicate the steps and the advice offered in this article. 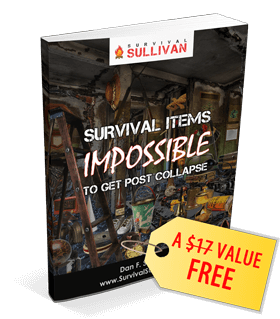 Neither the author nor www.SurvivalSullivan.com shall be held liable for any product you create using this article.